Guided hunts for Moose,Turkey, Deer, and Bear! Also ice fishing adventures for just about any species! 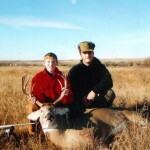 Fully guided archery/firearm deer hunting. Rabbit hunting with beagles. Spring &amp; fall turkey hunting. Professionally guided, very safe &amp; organized, nicely affordable pricing. If you are a Vermont Hunting Guides and would like your service listed here, use our Submission Form. It's Free!